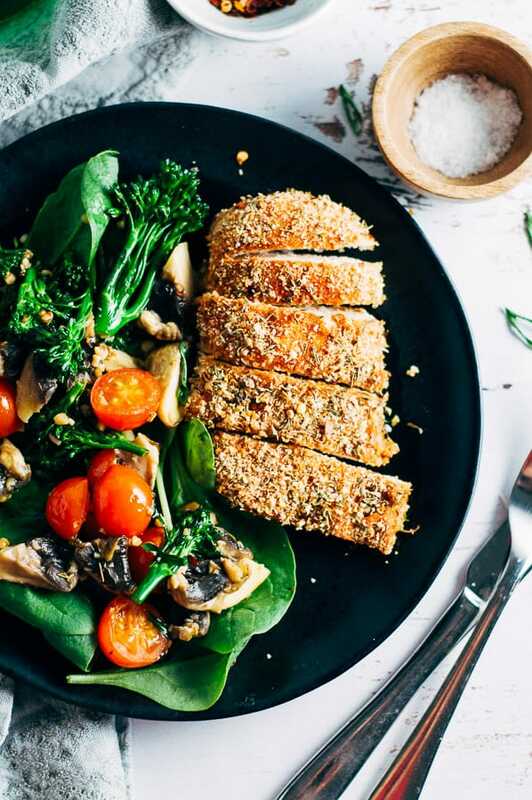 This Healthy Salt and Chilli Chicken is a light, low calorie and clean eating dinner that is on the table in 20 minutes. It’s fragrant, tender and with just the right amount of spice to wake up your tastebuds. 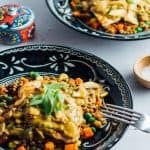 It’s an easy weeknight dinner that you can throw together without too much effort – chicken from freezer + spices from pantry + basically whatever veges you have in the fridge. It’s clean eating, no fuss, grown up food that won’t weigh you down, or leave you feeling hungry 20 minutes after eating it. 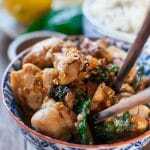 Healthy Salt and Chilli Chicken is totally one of those healthy meals you need to have when you’ve had a bender and you need to get back on the healthy eating wagon. Know what I mean? Particularly after Christmas as we spring into January and the month for cleaning out the system, and undoing all the holiday indulgence and over eating. Yep. This dish is the one to help you get back on that wagon. Not least of all because it contains some awesome spices that work really well together. Some of my favourite spices are in this mix– onion salt, garlic salt and especially paprika. I have all the paprika in my spice cupboard, and I’m especially fond of smoked paprika which I use frequently (like weekly) and is the hero ingredient in my smoky paprika chicken recipe. You have to try it. Its better than KFC, and 1000 times more healthier. It’s my go to when I want fried chicken without the fried part. 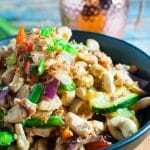 And this Healthy Salt and Chilli Chicken is like salt and pepper chicken or salt and pepper squid salad for that matter, only without the pepper and with chilli instead. It gives it a little more contrast and is a little bit more grown up. Although if you were preparing this dish for your family or maybe your significant other who isn’t that into spicy food, you could cut back on the chilli, or leave it out altogether. For a twist you could replace the chilli with another thing, like, say parmesan or sesame seeds or a combination of both. Be careful not to over salt the spice mix with additional salt – especially as you have the onion and garlic salt which add heaps of flavour. Here’s a thought. If you really like this chilli and salt spice combo, you could try it with pork or steak. I think that’s my next stop. And maybe even fish. That’s the cool thing about spices that I’m discovering. The versatility. You only need to know a few good ones, and you can use them in heaps of ways to create different dishes. Now that’s my kind of cooking! 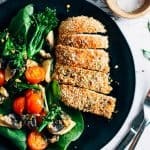 Looking for more quick and easy recipes for Dinner that you can get on the table in under 30 minutes? Get healthy no added sugar 30 minute Dinner Recipes Here. 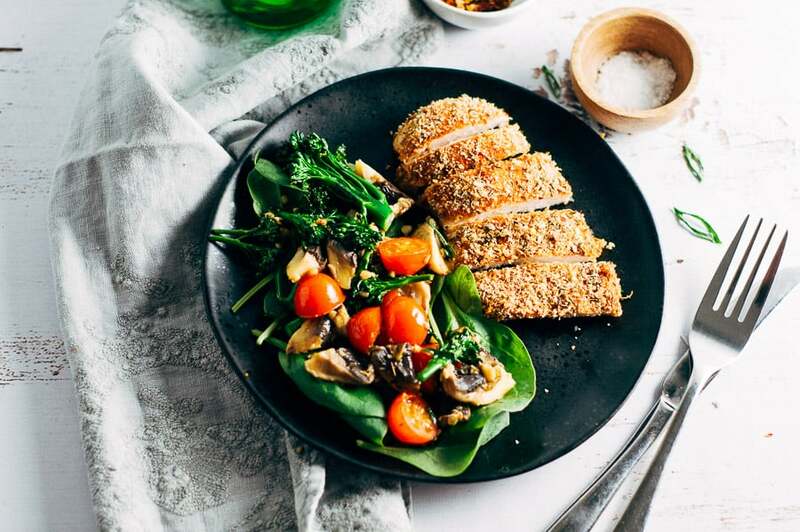 This Healthy Salt & Chilli Chicken is a light, low calorie and clean eating dinner that is on the table in 20 minutes. It’s fragrant, tender and with just the right amount of spice to wake up your tastebuds. Heat oven to 180 degrees/350 F.
Prepare the spice mix. 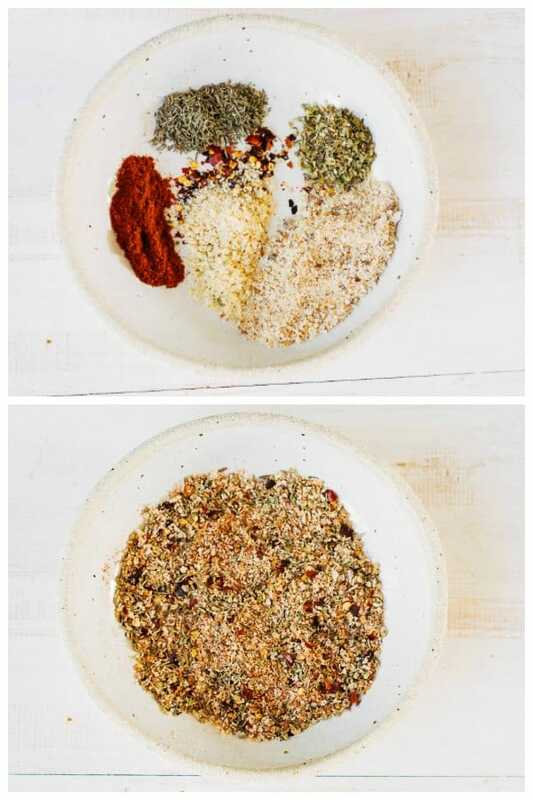 Place all spices and breadcrumbs in a small dish and stir with a spoon to combine. Place the chicken pieces in a backing tray and bake for 20 minutes. When the chicken has a few minutes to go start preparing the side. Heat a pan on medium heat on the stovetop. Add garlic and butter, followed by chopped mushrooms, cherry tomatoes. Cook for 1 minute, then add the spinach leaves and toss for 30 seconds. Remove chicken from oven once done, and plate up with the garlic mushrooms, tomatoes and spinach. Serve and enjoy straight away. This amount of chilli produces what I would call a mild to light medium amount of hotness. If you can tolerate medium Thai or Indian curries, this will be fine. Otherwise, dial back the chilli flakes to a quarter of a teaspoon, keeping all the other spices the same. Thanks Albert. This is super easy and a tasty dish. I make it every couple of weeks!